FirstBike makes a whole line-up of balance bikes for kids aged ~18 months – 3 years. Their frame is a unique composite material that is virtually unbreakable AND has no sharp edges, which is great for younger kids. 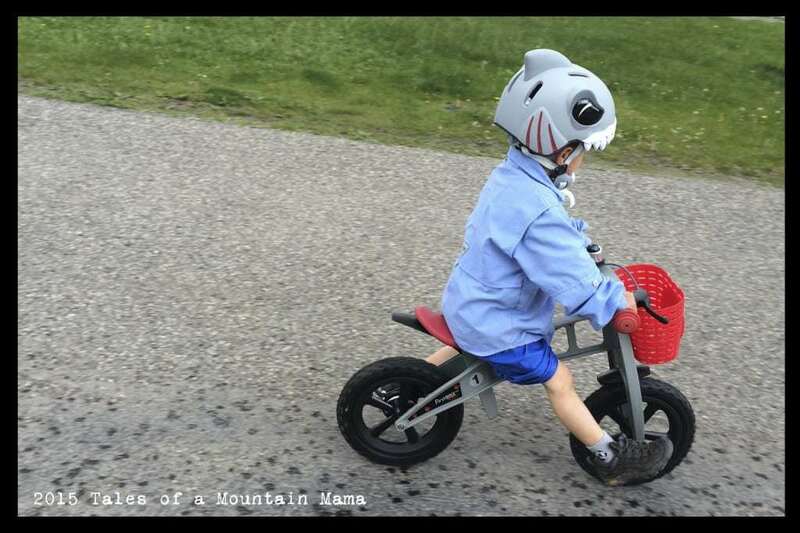 P has been riding a pedal bike for a long time now, but at least a few times a week, he pulls out a balance bike to ride on. He likes the fact that they are fun and comfortable to ride – and it’s always good to mix it up a bit! Since he is on the smaller side for his age (just now growing out of 3T pants), he’s a great tester for our family for balance bikes. Plus, he loves to go off jumps and “do tricks” which allows us to challenge the bike just a little bit. 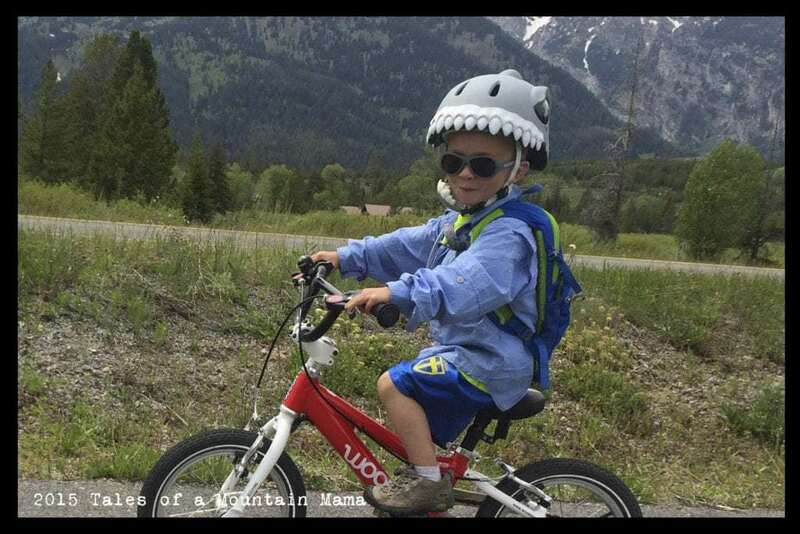 After years of fine-tuning and testing, FirstBike bikes stand out as what they claim as THE safest balance bikes on the market. Their all-plastic frame means they are extremely long-lasting and easily function in a smooth motion for the rider. The FirstBike Cross has quite possible the easiest-to-use handbrake on a balance bike we have seen and tested. 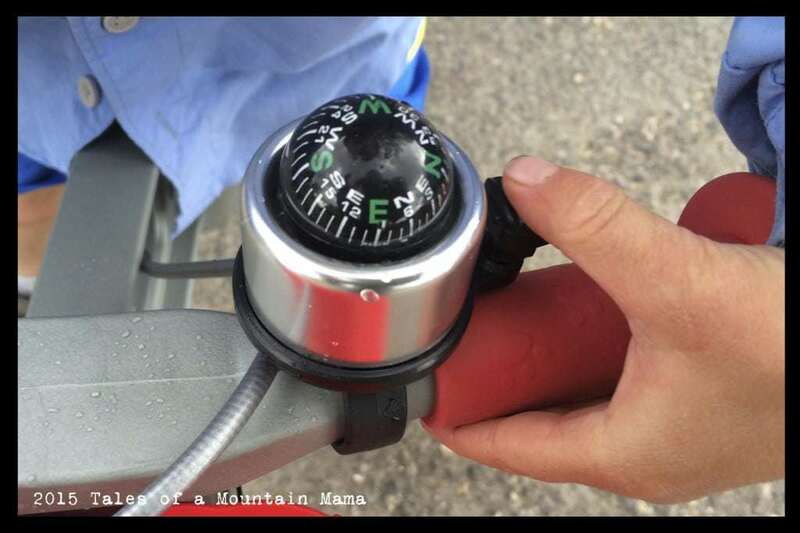 It responds well, is small enough for little hands AND is adjustable. We believe strongly that kids should be exposed to a hand brake from early on, so this is a big perk for us. 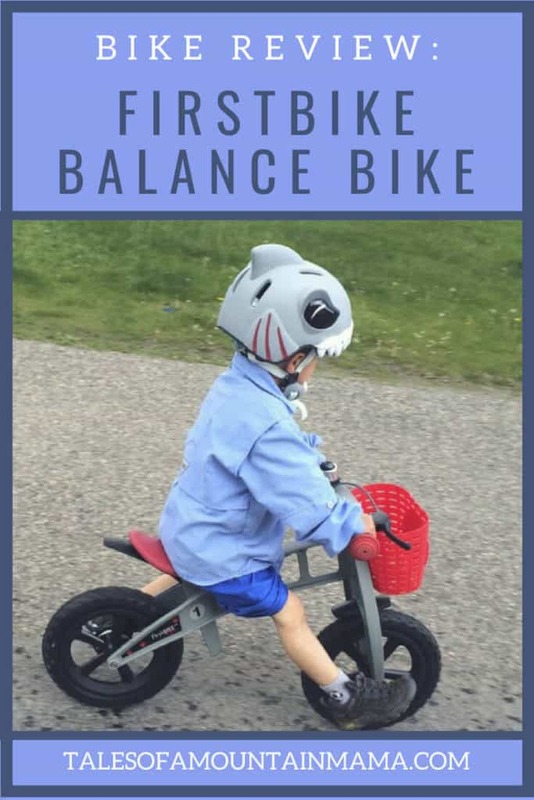 It also rolls extremely well (better than any other balance bike we have used) and has perfect geometry to keep little ones in a comfortable and upright position. 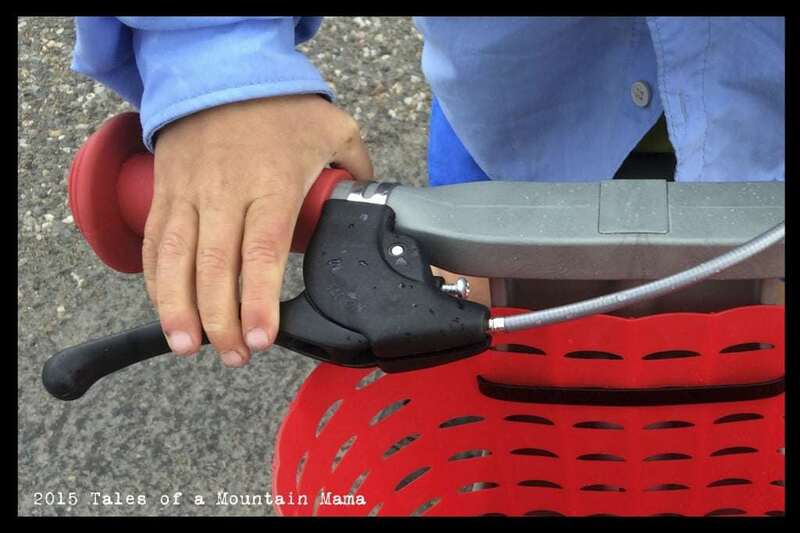 P also loves how lightweight it is – he can easily pick it up to go over obstacles as he wishes. The composite frame is super durable and flexes to allow for absorbtion of bumps and more comfort for the rider. However, it does have limitations. 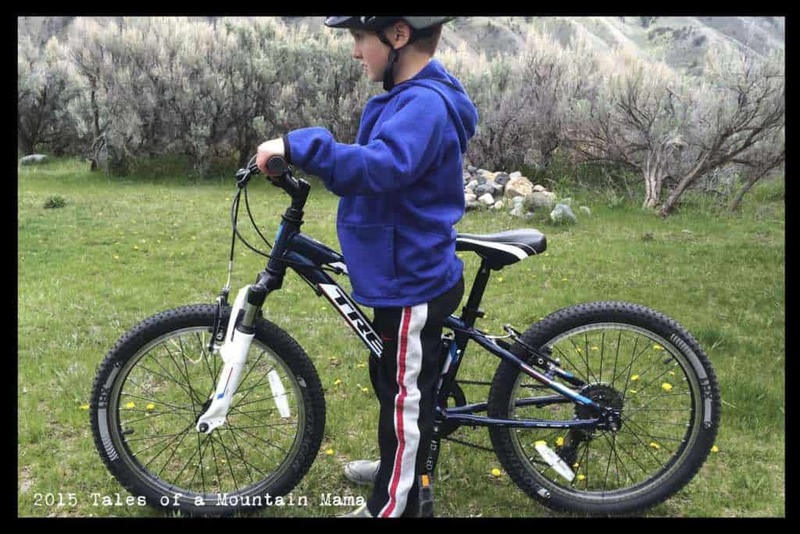 Because of that flex in the frame, the bike isn’t suitable for kids over ~3 years old and ~40 pounds. J rode it (aged 6, 50 pounds) and commented immediately about how “it doesn’t steer straight”. While it certainly won’t break, that flexing means a very wobbly ride that, like he said, is difficult to keep going in a straight line. You really can’t look at these photos without noticing the helmet. P gets more comments on that helmet than anything else – with good reason! Mr. Shark Attack is definitely an attention-getter. It is one of the 9 designs of Crazy Safety helmets, available through FirstBike. While in general I tend to avoid “cutesy” helmets and bikes, I knew P in particular would be interested in wearing it. I quickly found that J was wishing he had one too. 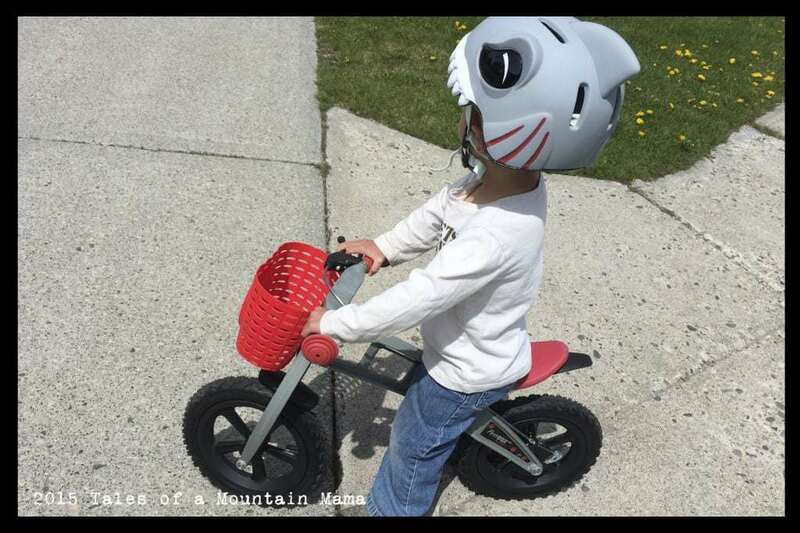 The helmets are a perfect way to get a kiddo who is a hard sell on wearing a helmet to get one on their head. At only$30, these helmets are a good price-point, look cool AND keep little heads protected. The only big gripe I have about them is that initially the set-up is a bit tricky with the chin cup (but the teeth are SO cool). The first few days P wore it, I felt like I was constantly adjusting to try to get it right. Sharing it back and forth with his brother was out of the question because I didn’t want to deal with the adjustments back and forth. While the extra straps do tuck in, they tend to come lose and hang more than we’d like too. He is picky about anything over his ears and so getting it small enough AND fitting the chin cup in was very tricky. Small adjustments as we go! 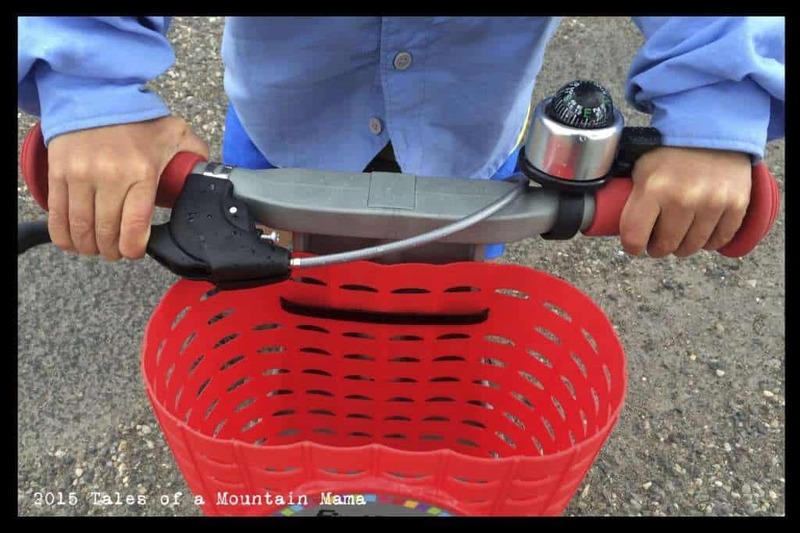 Every bike needs a bell (especially for new riders that need a little incentive.) At $8.99 and tons of neat designs, they’re a no-brainer add-on. I am pretty sure the basket is P’s favorite part. I was a bit surprised that the installation was just hanging it with zip-ties, but I appreciate the simplicity of it. The basket is tough and I suspect the zip ties will fail before the basket. Available in 5 different tire styles (Basic, Street, Cross, Racing and Limited) and a variety of colors, the FirstBike is an excellent bike for toddlers and young preschoolers. This is truly a toddler bike. Kids over ~40 pounds are too much for this bike and it flexes (though won’t break) and makes it hard to steer. FirstBike generously provided us this gear in order to facilitate this review. However, as always, the opinions expressed here are completely and honestly our own. You can find my full disclosure here. I love their bikes. 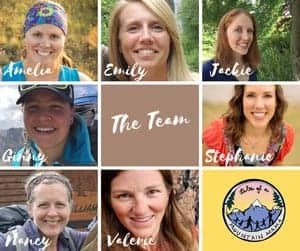 They are really well made. This bike looks so cool!! And that helmet!! Looking cool & having fun while being safe and exercising. Great combo! My mother in law just saw these recently on GMA and hasn’t stopped raving about them. 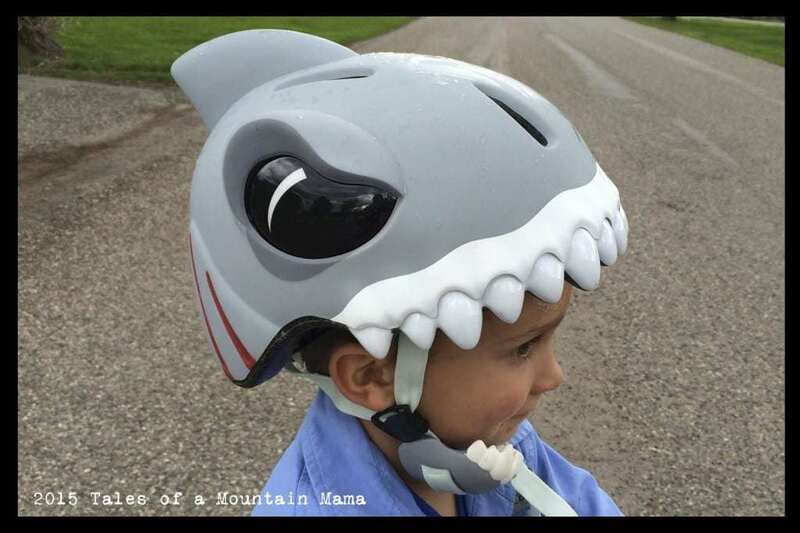 The shark helmet would be my sons favorite!